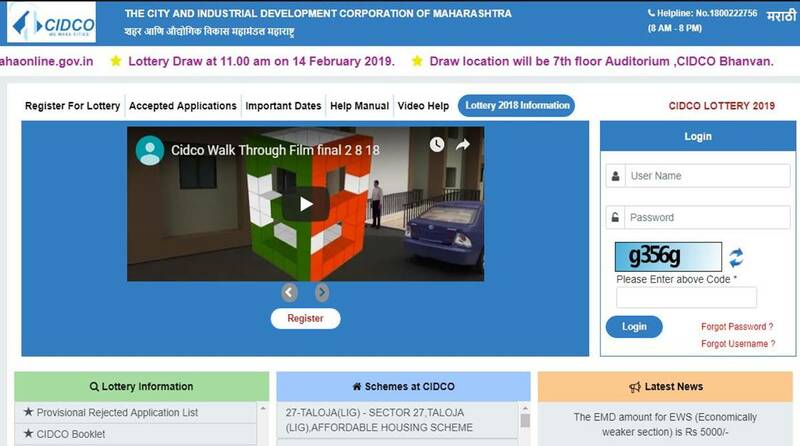 CIDCO lottery 2019 Mumbai: The City and Industrial Development Corporation (CIDCO) will conduct a lottery draw for 1100 homes in Mumbai Metropolitan Region on 14 February 2019. According to latest reports, the final list of accepted applications will be published at 1 pm today, i.e 11 February 2019, on the official website lottery.cidcoindia.com. The final draw will take place at the 7th floor auditorium of CIDCO Bhavan at 11 am. The results of the lottery draw will also be announced on the CIDCO official website lottery.cidcoindia.com. CIDCO has already published the Provisional Accepted and Rejected Application list on the website. According to reports, over 2 lakh people had applied for 14,838 CIDCO homes. When CIDCO lottery results were announced in October 2018, as many as 1,100 homes had remained unsold. These houses are located in Navi Mumbai’s Ghansoli, and Kharghar, Taloja, Kalamboli, and Dronagiri near Uran. The houses are reserved for Economically Weaker Section (EWS) and Lower Income Group (LIG) families. Registrations had started on 1 January and ended on 30 January. The EMD or Earnest Money Deposit amount for EWS was Rs 5000, while that for LIG was Rs 25000. The LIG houses come with a total built-up area of over 56 square metres and a carpet area of over 29 sq m. The EWS houses will have a built-up area over 48 sq m and carpet area above 25.81 sq m.
The base cost of LIG houses exceeds Rs 25 lakh, while that of EWS house is upward of Rs 18 lakh.